← It’s Time To Buy Your Canadian Shuffler Friend a Coffee!! Shuffleboard club brings seniors together!! Sent along by Bob Weber with Thanks!! Shuffleboard Club vice president Terry Guido, left, and new member Paul Kegel compete in a doubles match at Pass-A-Grille Park. ST. PETE BEACH – For most seniors, finding something to fill their idle time can be a challenge. But for a group of 40 to 50 shuffleboard enthusiasts, that’s not a problem. 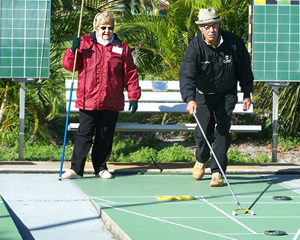 Three times a week they meet at Pass-A-Grille Park, a quaint location at 10th Avenue and Pass-A-Grille Way, for camaraderie, socializing and, oh yes … some pretty good games of shuffleboard. According to president Jim Barber, the Pass-A-Grille Shuffleboard Club dates back to the 1950s and Barber, 82, has been a member for the last 32 years. The atmosphere is very friendly but underneath it all, there is a driving ambition by most to win. But at the same time, anybody can participate. “After about three months, you know what you’re doing,” said club vice president Terry Guido, 75, a winter visitor from Union, New Jersey. Barber still remembers his first try at the sport when he joined the club in 1983. And he still recalls some sage advice from club founder Bernie Horne. “He said ‘Kid, this is a very scientific game and I don’t know if you’ll ever get it.’” Barber said. Barber did get it and is now a very skilled player. He enjoys using a defensive strategy in some situations and an offensive game plan in others. Other times, he changes up his game to confuse an opponent. “The hardest part of this game is to put it (the disc) exactly in the spot you want it to go,” said Barber. On the days that it doesn’t go where a player would like, that’s OK too. “Yeah,” said Barber. “We don’t really care what the score is. This is just for fun.” For Guido, it’s an opportunity to get out of the house. The object of the game is to slide a disc down the court into a 10-point triangle or 8-point and 7-point squares. A team or individual that reaches 75 points is the winner. However, the Pass-A-Grille club plays in 25-minute increments and then switches courts. The club plays Tuesdays, Thursdays and Saturdays at 10 a.m. Members play both doubles and singles on most days. In February, they compete for trophies in the annual Hurley Tournament, sponsored by Frank T. Hurley Associates of Pass-A-Grille. For more information about joining the club, contact Barber at 360-1858 or Guido at 367-6937. Posted on http://theshuffler.net 2015 01 29.